Recently been feeling very hungry leh. Like can eat and eat and eat yet cannot full one leh. One Sunday after going to JayaOne for scooting, we pass by Subang Jaya . Was hungry then but since it was odd hours...how ah? Not yet dinner time but lunchtime over liao lo. Mamarazzi thought go Tong Kee (B9-G, Jalan SS 15/4D) to buy some egg tarts. Then Papa spotted this Burger Truck. Ordered a Cheese burger for me... No Chili ah. Wah.....much much bigger than ahem ahem ahem burger wor. Mamarazzi also kaypoh....had a messy burger also. But hers a bit too much sauce. Taste wise and price was good. Better than ahem ahem burger. Maybe coz so many things made up the burger...Mamarazzi couldn't fininsh eating that. Less than RM5 ...not bad leh. 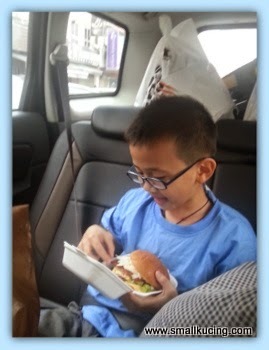 Mak Oi this Mamarazzi made the photos so small.. at first Uncle SK thought where is the D'New Burger SHOP!! 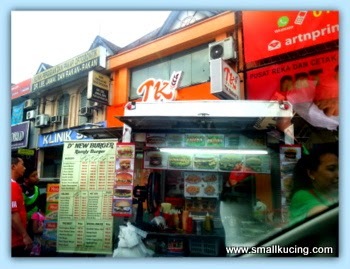 puas he cari-cari along that row of shop ni.. rupa-rupanya it's thst stall in front of the shops dei~~ hahaha!!! Wah your Mamarazzi is such a small eater. Did you help her finish her burger? Think so . Coz they also was recurring business ma. If cook nice for customer then they get more profit. SEDAP leh when Uncle SK sees that!! aiyoh, tummy also playing drums already lah.. better stop thinking and go to sleep quickly, muahahaha!! I think you are having a big growth spurt, that is why you are always hungry. Growing boys really need a lot of food!! The meat is still red. Unusual for a burger in Europe. They did not toast the bread? Doesn't look like much...but it's always the taste that counts. Some from the roadside stalls can be really good...a whole lot nicer than the expensive ones at the shops. Best part - so cheap some more! Indeed it looks good for less than RM5! I always love this type of burgers sold in stall than those commercialised burgers. So another post will be on the egg tart? Seems good value for the money.... better than the commercial ones! I'm curious if anyone actually understands what ahem ahem burger is? Very pekcek leh, so abstract! 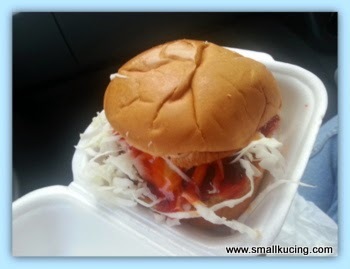 I find that this type of burger sold at warong or truck taste much better than the ahem ahem burger. Cheaper some more. 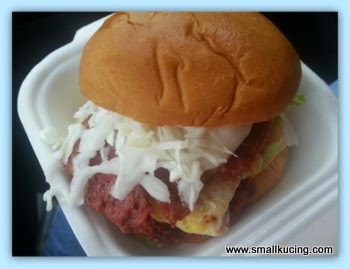 wah the burger looks huge wor....nie mesti burger special punye! Ramly patty issit? I used to patronise a burger stall near my office, loved it coz they put fried onions for topping. not sure coz didnt go down from the car. Order from the car only. That looks like magnificent burger! Yum! Been hearing and reading about the burger food trucks in SS15. There are also others besides the dnew. I would love to try soon. Loks like you had a tasty treat, did you eat it all? Mamarazzi is such small eater, couldn't finish that burger, Auntie Yannie can wallop two lo! By the way, I enjoy looking at Small Kucing pictures at the side bar, so cute la! Wakakakaka! Look at the back seat of your car, so many barangs! Good that the space is fully utilized unlike me. Lately I have slowed down eating burgers and carbos after seeing the weighing scales. So scary lah! CNY coming and my scales might burst the springs! After seeing your burger post, I might try that Burger Truck which Huai Bin posted recently. So bad lah Mamarazzi tempted me to eat burgers again.